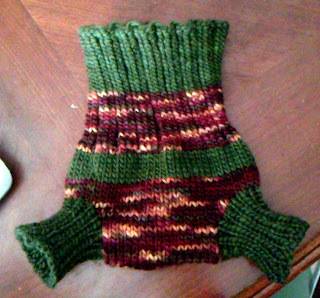 So here it is this morning after I finished up the ribbing on the second leg cuff. 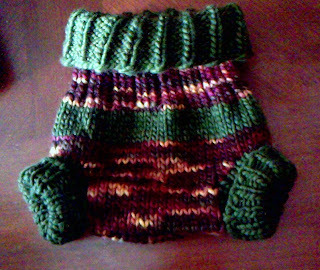 I knit the entire tiny soaker last night with that exception. The color IRL are very pretty olive and harvest mix (both Malabrigo leftover from my f.pea mossy sweater and my first pair of knit longies). I did a k3tbl, p1 ribbing for 21 rows approximately, then switched to St st, and did k1,p1 ribbing for the leg cuffs for 15 rows. Jim got a giggle over the "pod legs" as he calls them. I used the sewn BO that I learned from knitting up my Baudelaire sock (I have to start the next one...I'm definitely doing two-at-a-time-toe-up-socks next time!) It's attractive, trim, and stretchy. So, I need to knit up some socks for the baby too. I haven't gotten my BFL from Angels & Elephants that I ordered (coming from UK so it's cheaper, but might take a bit long with the holidays) so I found a pattern that calls for DK yarn for baby socks. I'm going to see how that goes with my locally spun alpaca that I got. It looks to be a DK weight so I'll swatch it and see. I was thinking of doing the Saartjie booties out of it (Bockstark way to use that wonderful magic CO) also but I think it might be a little big and if so, I'll probably wait for my BFL sock to just make life a little simpler right now. I think we're ready for the holidays. Despite the fact that I haven't done any baking, have no idea what I'm cooking for Yule or xmas, and that I never sent out my holiday cards yet. Oh yeah...I need to scan that Santa picture.